We took the all night train from Budapest to Brasov commencing our journey at 730 pm. It is a 12 hour trip and we have a sleeping car which turns out to be compact and clean with a sink and a bunkbed. It was relaxing to sit with our feet up, listening to the clickety clack as we quietly chatted. Since it was already dark we did not bother looking out the window. The conductor was nice and told us we would get breakfast in the dining car as it was included in the price of our ticket. We ate chocolate and chips and felt very cozy. Jeff had to take the upper bunk as I wasn't about to climb up there!! We had a good laugh as the bunk was narrow and he was worried he would fall out. it should have come with some kind of strap to hold him in. Somewhere between 11 and midnight customs stopped by twice, first the Hungarians, then, just as I may have been falling asleep, the Romanians. All they did was look at our passports and stamp them. I like the train, the swaying motion, etc but I do not think I slept a wink. I was a bit worried that Jeff might roll over and crash to the floor and also did not want to be sleeping when we rolled into Brasov. But I had a nice rest in my snug little bed. Anyway we officially got up and went for our "free" breakfast at 7 in the "dining car." It was so misty, foggy, trees, rolling hills, tiny mountains, rocky, I did not see the wolves, but felt them, sensed them. In the grey morning light we saw a wagon pulled by horses, more like a farm cart, still it made me think about a headless horseman. By 930 am we have taken a taxi for ten euros to our "hostel." I booked it on HostelWorld, but it is really a private home. Spotless, old fashioned, greeted by Martha, 79, who showed us our room, utterly charming. She speaks French and Romanian it seems, so with gestures and a few words in both languages we learn that her son will be home in the evening. We leave our packs and trundle off to explore Brasov. I am back in my hat and mitts and Jeff needs to buy a toque. It is an alpine town. The mountain air is crisp, an overcast fall day. Within a block we are in a store, maybe 12 by 12 feet, tops, and met the affable thirty something owner, Lewis, who used to work in some kind of movie marketing job and gave it up for this mountain gear shop. We had a fine time visiting with him, had a few laughs, Jeff bought a toque. Lewis knows of Whistler and Vancouver, the perfect combination, ocean and mountains. We didn't have a map at this point so just walked until we found a nice restaurant, where we had coffee and an early lunch. Wifi is available so we check our emails. 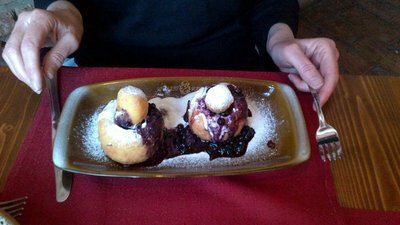 It is 11 am, I have a glass of red wine, soup and bread, and then later their special dessert which is like two tennis ball size doughnuts with a vanilla sauce topped off by blueberry sauce. Served warm, very good, yum yum. Good food on a crisp day and now the sun is out. Three older ladies, pearls, well coifed grey hair, take the table next to us. They order wine and eventually eat lunch. So European. Just like me only leave out the well coiffed and pearls. I am catching on to the culture. We dawdle about, our whole effort here costs twenty dollars, not bad, and a pleasant environment. Jeff had a big plate of sausage and potatoes, a few cappuccinos and our favourite tonic water Kinsleys. Very lemony and good but wine or beer are cheaper. 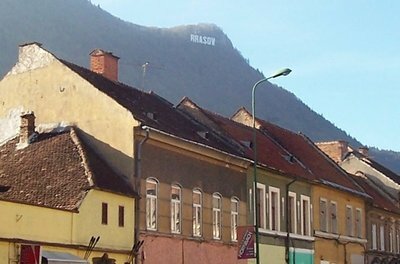 Having now killed two hours we go for a walk, check out the local stores, look at the surrounding hills, the "Hollywood" like Brasov sign and pick up a map and some tourist literature. We go back to our lodging, have a nap, Eugine the cheerful English speaking owner comes home, chats with us a bit. We go, on his recommendation, to Pepperonis for supper. All wood, mountaineering style, I have a Romanian dish, pork stew with a fried egg over polenta. Jeff had chicken schawarma which came on a big plate with salad and fries. Later we visited with Eugine in the comfy, old world living room, talked til 1130, at least three hours. His mom was a nurse. He is an engineer. When the communists left they got their property back. They are Romanian, celtic, dacian, something like that. The ancient Dacians lived around the Carpathian Mountains. Romanian is not to be confused with Roma which is a large culturally and socially disadvantaged group in Romania and other countries. Eugine talks about the monks in the mountains near the pineal clouds, water from the clouds is good for them. Or maybe he meant the clouds are good for the pineal gland, his English isn't perfect. Eugene knows a lot about natural remedies. The candle plant, verbascus phlomoides, is good for sore joints. Do we have that back home I wonder. You can tap the pure juice from the birch before they bud - note the white bark - tap in the spring like a maple and the juice is good for cancer. Also "sour of the rabbit", is this oxalis acetosella, watercress, good for parkinsons. There used to be 500.000 people in Brasov but since communism ended and the industries were taken out, it is half that size. That is a lot of people to lose in twenty years. Eugine's dad was also an engineer. He was not a communist. When communism ended the high placed communists all got mega rich. They were also better off during communism so for them it was a win win situation. It is like an old boy's club - if you were in the communist youth then you hire your homies in 2004. Before communism ended there was. in the last year, food rationing, all the agricultural products were being exported. If you were a good communist you had more food. He talks about chewing gum, "blades of gum", and how he craved it as a child. A fun conversation. There are a lot of Hungarians in Transylvania so we are fortunate to now meet a Romanian. The house is furnished in old school Romanian style I think, lots of ornaments, woven tablecloths, needlework table runners, persian style carpets everywhere, but they may be from here. There is a big antique, ceramic tile heater in the living room. Eugene warns us about pickpockets, especially around the train station and tells us about two Canadian mountain bikers who were robbed and slightly injured recently near Bran. From here on we are worried about being robbed even though we carry little cash and wear money belts and neck pouches. We are bulky all the time with this padding. Oct 19 - The day was bright and sunny and actually reached 20 C, a heat wave. Martha gave us a nice breakfast and insisted we have a small glass of brandy. So I had two, Jeff none, did I start out the day slightly tipsy? The main part of breakfast was a cheese in phyllo crust dish, flaky, slightly sweet pastry, brought north by the Ottomans but adopted as a treat here also, Jeff has had it before, is not fond of it, I eat most of his as well as mine so we don't offend the hostess, he will be served a version of this at least twice more in our travels before we get to Turkey. Placinta, there is a sweet and savoury version, we are served the sweet and it is presented and accepted as a special treat and sign of hospitality - albeit that we snuck Jeff's onto my plate, he is now offered more, oh no thank you, no thank you, rubbing stomach, delicious. I like it but can only handle so much. This is such a cozy house, clean, quiet and comfortable. We walked to the old town, saw the black and white churches and took a few pictures of Council Square where, it is said, the Pied Piper led the children from Hamelin. There are numerous bakeries, coffee houses and shoe stores around the old town. All kinds of pleasant side walk cafes. Then at 11 am we decided to go to Dracula's castle. 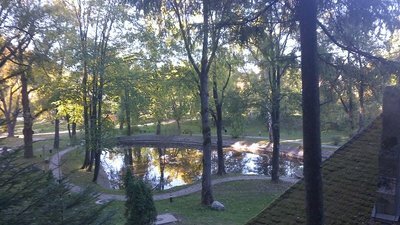 We got lost on our way to the bus station, likely walked five km, took us two hours to find it. Anyway the bus to Bran was only six lei one way and left right after we arrived which was good. Bran is a touristy, pretty alpine town. After exploring the picturesque downtown we purchased tickets to Dracula's Castle. It was a beautiful sunny day, small mountains all around, some fall colour, but still very green, a lovely day. Vlad the Impaler may never have set foot here but the castle was home to the royal family for a time and the grand daughter of Queen Victoria lived here. It was interesting to walk all through the castle, quite a large endeavor, furnished in period style, quite a few stairs and narrow passages. Worth it. Tick. We toured a castle. Now although Bram Stoker, the author, never set foot in this castle either, his classic work, Dracula, can easily be imagined here. Queen Marie of Romania is said to have lived here around 1920. Raised in England, the granddaughter of Queen Victoria, she married Ferdinand of Romania when she was seventeen. Queen Marie was a glamorous and interesting figure, her rumoured affairs and unlikely friendship with the Canadian, Klondike Joe Boyle, are documented, and perhaps her story could be a tourist draw as well. Just a suggestion. Joe and Marie got chummy during the first world war and she actually provided the tombstone to his gravesite in London, England. His remains were brought back home to Canada about sixty years after his death and he is now buried I think in Woodstock Ontario. 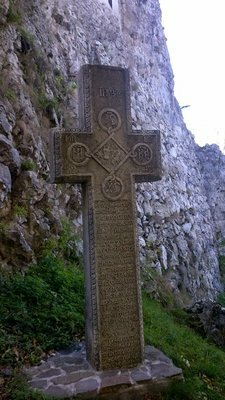 He was called the saviour of Romania and the inscription Queen Marie placed on his tomb reads "Man with the heart of a Viking, and the simple faith of a child." We ate lunch and had coffee in Bran and caught the van to Brasov at 440, the drive back was only half an hour. This whole endeavor, start to finish from the bus terminal in Brasov was just over four hours. 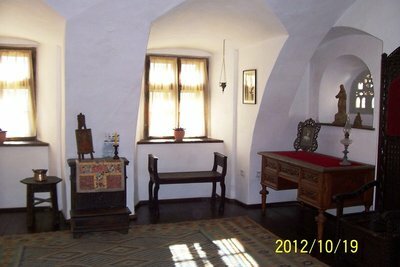 Anybody could do a daytrip from Brasov in five hours and see a lot of Bran. I enjoyed walking through the market and bought a small cutwork tablecloth, handmade, very similar to Hardanger embroidery. A souvenir of Romania. One Romanian Leu is about thirty cents Canadian. Therefore a thirty leu tablecloth is about ten dollars. Brasov has a population of about 228,000 and is surrounded by the Carpathian mountains. Bran is a town of about 5000 but does do a brisk tourist trade, thanks to the castle. Try to get rid of your Romanian money in Romania. It may be difficult to convert it in another country. We stayed at Eugine Jr and Garlicia Guesthouse for twenty five Canadian dollars a night. What a bargain!! Breakfast was not included but Martha did serve us two breakfasts and gave us brandy and cake so we were treated very well. Very homey and warm and exceptionally clean and quiet. We are wondering why we are still stiff and achy having walked 10 ks a day for a month now. Jeff was chilled last night and not too perky today. Now I have a theory. Mild food poisoning or the flu. The landlord, Eugene, in Brasov, gave us special herb tea with lemon and at noon we trundled off to the train station. He called a cab for us and it was one third cheaper than our inaugural trip. The train station has all kinds of unsavoury types hanging around and we have been warned about pickpockets. 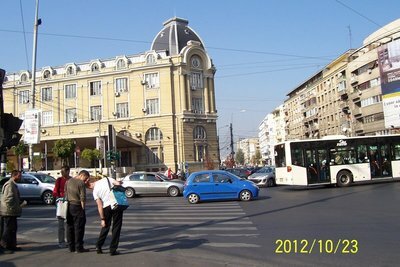 We have booked to Bucharest with the idea that we will book the overnight train to Sofia from there. About seventeen Canadian each from Brasov to Bucharest, about 120 kilometres. We have seats, the train gets pretty full and eventually there are people standing. Beggars come around from time to time. One kid passes out photocopies of some hard luck story and then comes back around and picks up his money and the photocopies. Another older guy came around, I thought he was crawling but Jeff told me later he didn't have legs. Well, he started the conversation out by saying "I wonder if they get more money if they don't have legs,.....". I'd like to know how he got on the train. Get into Bucharest at 510 and find out there is no sleeper car available to Sofia tonight, we can get one tomorrow for four people. We don't want to share so will take the day train or bus. We book into a hostel with wifi and try to get a cab but the driver waves us away with "Get some exercise". No cab driver will take us as the hostel is close and the fare is too low. We now spend two hours looking for the hostel with no luck, ask numerous people for directions, wave down taxis, get refused, it is dark and the streets are badly in need of repair. Shortly after 8 pm we found a cab driver who took us to the hostel and then they were full and moved us to an affiliate by private car. We had walked through so many dodgy streets we were glad to bunk in across from the French embassy. I must have gone to sleep by 930, felt chilled and exhausted and then Jeff got sick at 5 am so now he is back sleeping but I am awake. close to the train station, where the young man behind the desk spoke good English and did his best to tell us what streets to take. Someone pointed out that we would be walking through a sketchy neighbourhood. Well I was more surprised today in daylight to see several people running around in housecoats. Like instead of throwing on a sweater I will go out in my housecoat, sit on a chair on the street and visit with my neighbours. Of course last night there were a lot more wearing housecoats because today is warm and sunny. The sidewalks and roads are in poor condition, we were lucky we did not fall in a hole or get tangled up in a loose wire. There are a lot of loose wires and what appears to be power lines strung through the trees. I would like to get that type of thing in a picture, I would also like to take snaps of some Romas with their long black braids but then I have been warned not to so I don't. Roma are not Romanian but rather from India it is speculated, they have been here since the thirteenth century. Another name, gypsy, is from Egyptian though. There are a lot of gypsies in the Balkans and right now I am one of them. Boy, we are lucky - we could have done worse than wander around and get sore feet last night, with the loose electrical wires flapping around, large holes in the pavement and the stray dogs. Last night was the second time we could have benefited from having a cell phone, otherwise it has not been much of an issue. Bucharest seems way more run down than Brasov. So because we are still under the weather we decided to book into our first real hotel, Hello, for 33 euros which is only a few dollars more than the hostel. Very nice and a tv with BBC so we catch up on the news. We walked here from our hostel and this evening walked to the train station and got our tickets, 280 rom for two seats, we leave at one pm and get into Sofia at 1030 at night. We are splurging and staying at the Budapest Hotel for sixty Canadian a night for two nights. Some guys at the hostel were saying the train is dodgy and filthy, but we found the train from Brasov fairly comfortable, even though it was crowded, there were beggars on it and there was no toilet paper in the washrooms. We actually saw very little of Bucharest, other than the area around the French Embassy which has been gentrified and then wherever we were last night in this area near the train station. The largest Parliament Building in the world is here though, with the lofty title, Palace of Parliament. It is 5 am, between Jeff snoring and the dogs barking I couldn't get back to sleep, after I initially woke up at 330 am. Must try to get some rest so I am alert tomorrow. We have now travelled over 13000 kilometres. It's funny that we don't hear dogs during the day. Human population of Bucharest is around 1.6 million, dog population is likely 10,000 strays, apparently 75 people get bitten every day but I only discovered this after we left, on the internet, so do not have proper stats.